On April 26th, 2010, an unknown board game publisher took a chance with an unknown designer, teaming up to fund a game's production through very unconventional means. Sixty days later, gamers were watching when Alien Frontiers did more than just defy expectations. The game wove a thread between two industries primed for rapid growth: crowdfunding and tabletop game publishing. Once all of the pledges were in, Alien Frontiers raised $14,885, setting a new record as the most-funded gaming project on Kickstarter and casting both publisher Clever Mojo Games and designer Tory Niemann into the spotlight. According to Kickstarter staff, Alien Frontiers was only the 48th gaming project to be successfully funded on Kickstarter, and among those 48, it was only the 4th board game. These days, a million dollars won't garner a top-10 spot among Kickstarter's most successful tabletop gaming projects, but back in mid-2010, the tabletop industry wasn't watching Kickstarter until Alien Frontiers turned heads. 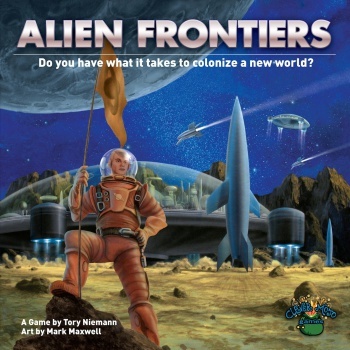 Alien Frontiers was unique among its predecessors, showing the early indications of a break-out commercial success. The game coupled an engaging play experience with high production values, and served as an early entry in a new class of games that merge thematic American and strategic European game design styles. But given the amount of historical significance being granted to this project, how then, did the unlikely combination of neophyte publisher and game designer come to be? Like most good gaming stories, this one has its fair share of luck. After misplaying a few rules in Kingsburg, a game with similar "die rolling as worker placement" game mechanics, Tory Niemann stumbled upon what he felt was a superior experience, providing him the foundation to create Alien Frontiers. Tory got to work, and this new mix of mechanics spurred strong initial reactions, giving Tory hope that this might be his first game to reach market. As luck would have it, Tory also had a family tie to an up-and-coming publisher. David MacKenzie, who had recently formed Clever Mojo Games, was the brother of Tory Niemann's sister-in-law's father-in-law. Let that one sit for a moment as your work through the family tree. Prior to Alien Frontiers, Tory Niemann had designed a party game by the name of Hook, Line, and Sinker, and shopped the game around to several major publishers. Unfortunately for Tory, none of those publishers took notice, and that experience influenced the path of Tory's future efforts. After giving David MacKenzie an early look at Alien Frontiers, Tory began consulting with David on the development of the game. A strong working relationship quickly followed, and given David's strong interest, Tory never felt any hesitation about partnering with a small independent publisher. That relationship remained untested until the uncertain element of crowdfunding entered the picture.